Parkview Elementary serves children and families in Guilford County North Carolina through an arts-integrated curriculum. My role was to support them in their efforts to nest technology-infused learning experiences into their work with children. Funding had made available many new tablet devices, but the volume of initiatives was pushing effective implementation further down the list of things to do. My ultimate role was battling the “monster of more,” by answering the question of how we grow as a school without just piling on more and more. During the first part of our work together, I focused our attention on letting go of the pressure and negative mental models of previous initiatives. Before mid-morning of the first day, I could feel the pressure release from the system. Teachers were moving around the room, having conversations about the purpose of school and what innovative schools look like. In addition, our work also amplified the voice of many of the teachers in the room. They were excited to talk about their ideas in the open, welcoming atmosphere that everyone in the room was providing. Throughout the day, teachers were low-tech as they talked about high-tech tools. They were using poster board and sticky notes to release trapped wisdom into the system. Innovative teachers and innovative teachers in training need time to listen, share, and shape new ideas. I was able to encourage them to take fresh risks for kids the next day, the next week, and the next year as they began to transform their teaching. We used this fresh energy to explore opening new doors for kids through technology. We focused on how new devices can be used for creating and collaborating. 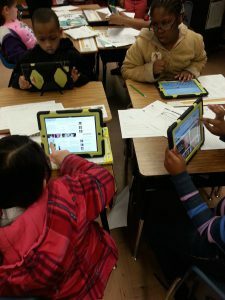 To do this, I had teachers use four digital tools to review written and video resources on excellent teaching. Though the resources were high engagement for teachers, the key to the activities was the opportunity to practice using the digital tools. We then did some reflection on how each of these could be used across grade level and subject area. The beauty of this section of the work was the additional tools that teachers mentioned during the reflection. The smartest person in the room is always the room! We examined Google Forms, Padlet, Today’s Meet, and Google Keep. Each of these can serve as tools for formative assessment, collaborative writing, and more. It was exciting to hear that some of this work was already in its infancy in some of the classrooms. As the afternoon drew to a close, the teachers were eager to head home to try a few of the new resources and ideas that we cultivated in our sessions. In the final moments of my day at Parkview, a teacher approached and said that having me support the school helped her loneliness fade. She explained that she had been working with new devices for a while now by herself, but she felt a shift today, and there were new allies in her work to close the digital divide for her students. A great day of support for excellent teachers topped with a small moment that allows us to know that transformational change is possible.